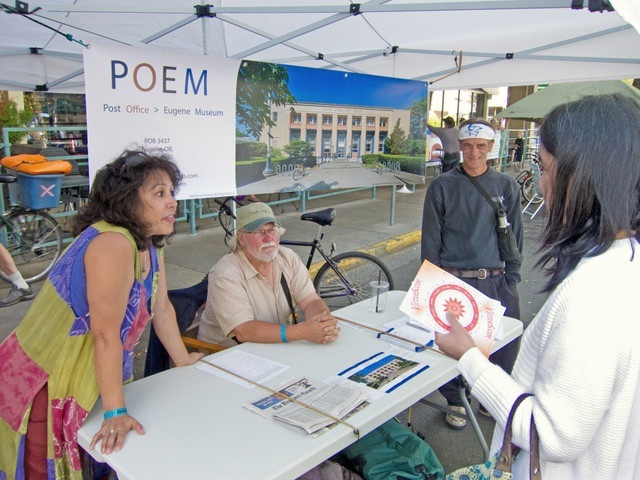 I recently joined a conversation with a group of artists and arts professionals about the concept of transforming the historic U.S. Post Office building into a Eugene Museum (POEM). POEM’s basic objective is to create a museum in downtown Eugene dedicated to historic and contemporary art of the Pacific Northwest. Beyond that, POEM hopes to make the historic Post Office on Willamette Street that home. This hope is the inspiration for the name: Post Office > Eugene Museum. This Art Deco-era building at 520 Willamette Street, listed in the National Register of Historic Places, is for sale with an asking price of $2.1 million. The POEM discussion group strategized on the use of the facility, funding sources and partnerships, and researched sustainable funding practices that would ensure ongoing conservation and preservation of the art that is part of the building, and benefit from the historical value of the Carl Morris murals and the WPA era. A strategic plan of this enterprise is being created by this small group, based on a shared vision initially proposed by artist Jerry Ross. Two articles were written about this historic building’s potential (Eugene Weekly 4/5/2010, and Register-Guard 7/31/2010), that highlighted the Post Office building’s inherent and significant cultural value, and presented a unique opportunity to preserve a piece of our cultural heritage. Once a proposal is outlined, ultimately the matter will come down to – a) how this art museum would be funded and sustained; and b) what entity(s) should be responsible for this public project. What would it take to realize this vision? The visionary investor would understand that the value of arts and culture is in the elevation of a community spirit and economy, and finds satisfaction in contributing to the quality of life. An example of this philanthropic spirit is in the case of the Jaqua Academic Center for Student Athletes project that was funded entirely by one benefactor through a process of leasing the land from the UO and built the $41 million center as a private project, then presenting it to the University as a gift after it was completed (Register-Guard 8/10/2010). In the case of the Post Office building, if such a comprehensive plan could be realized, the project could be then be presented to an appropriate organization as a gift (with an endowment to fund for paid arts professionals to manage it). What a great gesture it would be for the arts and cultural industry to have such a benefactor to help realize a vision that would last for future generations. There are other approaches, of course, and the POEM discussion group will continue to meet and welcomes community input and support. The community may write to POEMpnw@gmail.com. POEM will develop a proposal, but ultimately, someone needs to step to the plate and move this project forward before the opportunity is gone. This entry was posted in Donors, museum, POEM, Post Office. Bookmark the permalink.